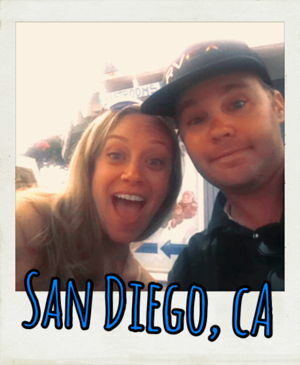 Since we go to La Jolla Cove often, we thought we’d check out someplace new. After checking out Yelp, we headed out to False Point and we were met with this beautiful sight. I mean, how gorgeous is this??? Anyway, when we both ended up free for the day, we decided to DYI our own tidepool tour and it did not disappoint. 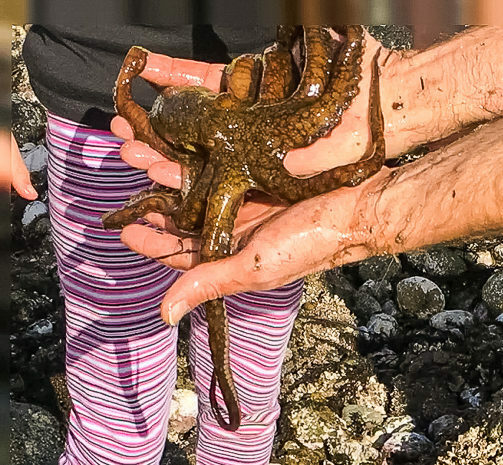 During low tide, you can see everything from purple sea urchins, giant green sea anemones, and sea slugs…even an octopus, if you’re lucky. A fellow tidepooler discovered this octopus underneath a rock and was nice enough to let us get a look up close and snap a pic. He also happened to be a marine biologist , so he told us all about the marine habitats of tidepools and gave us tips on what to look for. 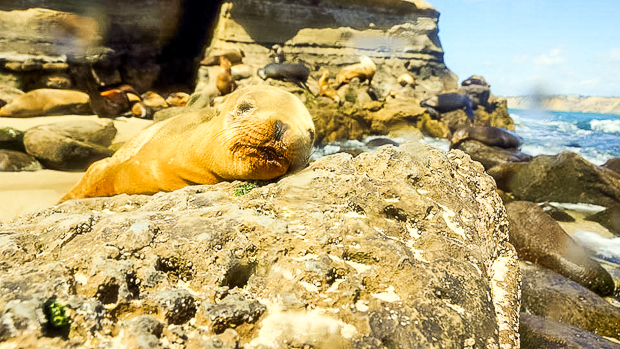 If you want to get a glimpse at San Diego’s sea life up close in a natural environment, we highly recommend checking out the tidepools at False Point. Here are a few tips and details that might help with your tidepooling adventure. False Point is located at Sea Ridge Drive and Linda Way in La Jolla California (it’s a little over 2 miles and less than 10 minutes from downtown La Jolla). Maps took us on a detour on La Jolla Scenic Drive and, wow, was this one time we were glad Siri led us astray. The view from the top = amazing. Probably one of the best views in San Diego. We were too awestruck to take a picture, but we’ll have to go back and snap some shots for you. Worth the drive just for that view. Once you get to False Point, street parking is available (free during certain hours – make sure to check signs before you park). It can be limited, so we recommend going during off-peak hours. 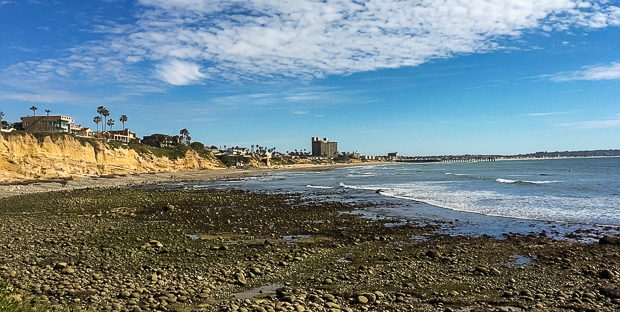 Weekdays are usually always a good time explore San Diego without the crowds. We lucked out and happened to score a spot on the weekend. 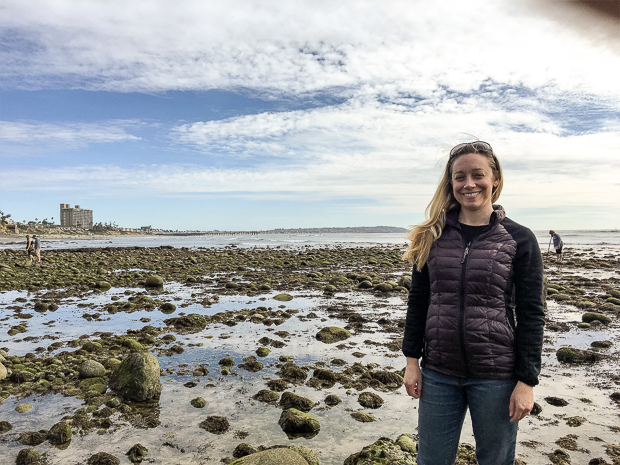 One of the things we really liked about False Point La Jolla is that it’s easy access – once we found a parking spot, it was just a quick jaunt down a set of stairs and we’d arrived. No Billy Goat tendencies or rock climbing skills required for this adventure. There’s also a bench at the top of the stairs in case you go with anyone who isn’t up to adventuring, or just wants to relax and enjoy the view. There are also TONS of tidepools to explore. Even if there are a lot of people, there’s plenty of room for everyone to have their own personal, private tidepool adventure during low tide. On a sidenote, we were excited to see that dogs are also allowed here during certain hours (again, make sure to check signs). We both love marine life (Todd is an avid scuba diver and underwater photographer) and we really enjoyed this adventure. It’s someplace we’d definitely visit again. We’d love to do one of the guided tours with the Birch Aquarium sometime to learn more about all the sea creatures from the aquarium’s trained naturalists. Until then, we’re all for exploring on our own when we get the chance, and we hope you do too – you never know what you might uncover. Make sure to visit the tidepools during low tide – that’s the best time to explore and have the chance to see lots of sea creatures. 🙂 The best season for tidepooling is November – March when minus tides make the beaches wider and tend to reveal more sea life. We loved that these tidepools were easy access, but the rocks are still covered with algae and a little slippery. 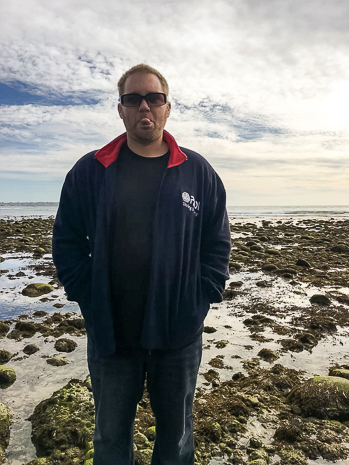 Todd slipped and twisted his ankle, but he and his sandals survived to see another day of tidepooling. Especially if you’ll be adventuring with kids. The rocks are sharp and it’s easy to get cut just by picking them up and turning them over – you don’t want an injury spoiling the fun. We got lucky and saw a TON of sea creatures on the day we visited. It’s pretty easy to spot anemones, but it can take a lot of turning over rocks and luck to see something like an octopus. And, of course, it’s best not to touch the marine life and leave that up to the guides and experts, like the marine biologist we met. 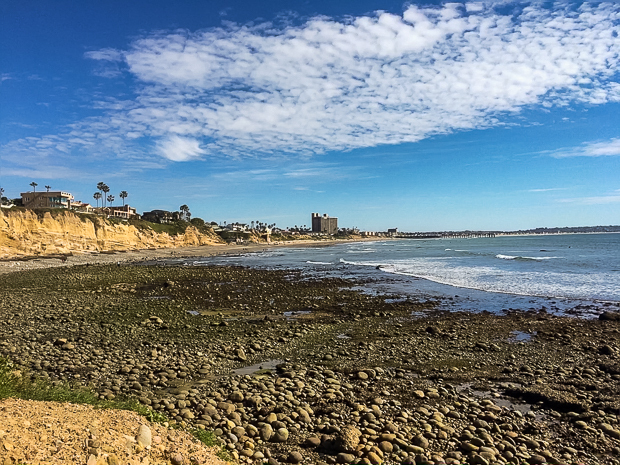 Have you been tidepooling in San Diego? What are your favorite spots? This post may contain affiliate links. Sandiegothotspots.com is a participant in the Amazon Services LLC Associates Program, an affiliate advertising program designed to provide a means for sites to earn advertising fees by advertising and linking to Amazon.com. We only share products and services that we think will be helpful to our readers.